Hamilton said this week he is “feeling that fire inside me” as he tries to leapfrog Mercedes team-mate Nico Rosberg at the top of the drivers’ championship in Hungary this weekend. Since the pair crashed in Montmeló (Barcelona, Spain) in May, Hamilton has won four out of five races to move to within one point of Rosberg. “Ever since the low of Barcelona I’ve been able to cultivate this really strong mental attitude,” he said. So now he’s feeling “fresh, powerful and confident” to face Hungarian Grand Prix where he has won four times so far. His last victory at the circuit came in 2013 and he was sixth last year. German Rosberg, 31, finished eighth in Hungary last year and has a highest-placed finish of fourth at the Hungaroring. If you trust Hamilton’s guts, get now this Betfair Offer for New Customers with enhanced odd for the british. This offer is now available and ends on Sunday 24th July 1:00 pm. 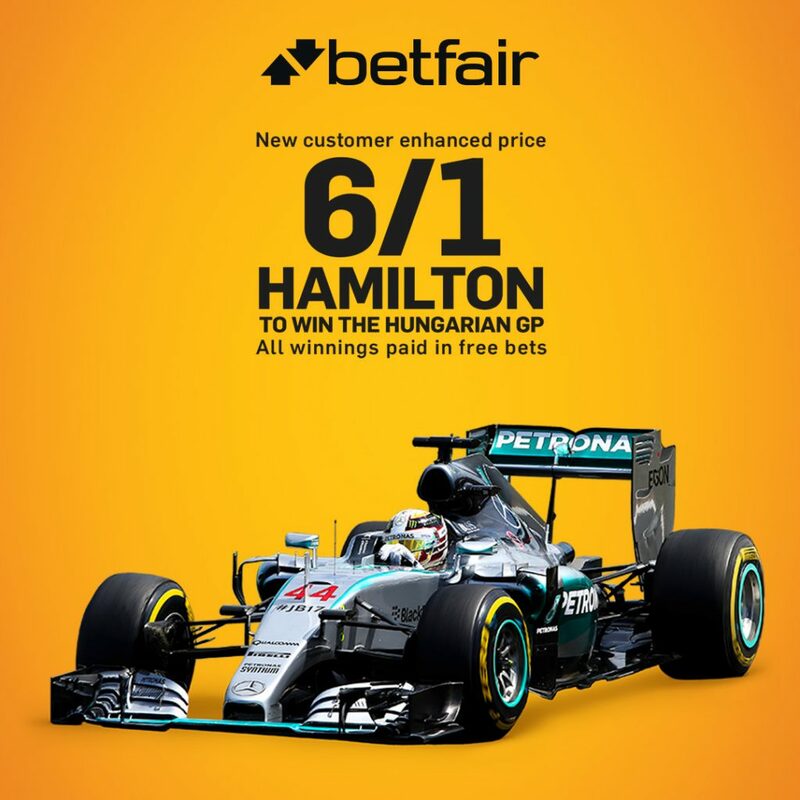 Join Betfair: open your new account today, using Promo code ZSAC63 to get 6/1 Hamilton to win the Hungarian GP. The code is key. Use it while opening your account or you will not be able to get this offer. Bet: bet (max €10) on Hamilton to win the Hungarian GP in the ‘New Customer’ market at the enhanced price. ALL WINNINGS PAID AS FREE BETS. Qualifying winning stake returned as cash. Exchange bets are excluded. Plus: then you qualify for up to €100 in free bets. Get €20 free bet awarded with every 5 x €10 bets you make. See terms for an example. What do you need to do? What do you need to know? Place a bet on Hamilton to win the Hungarian GP in the ‘New Customer’ market at the enhanced price.